Manphar Sarasa, the best blood purifier is brought to you by the ancient Manphar group, which has about 70 years of experience in Ayurvedic system of medicine. Impurities in blood cause many diseases from common fevers to chronic skin diseases. 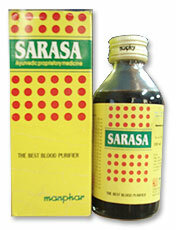 Manphar Sarasa is very effective in purifying blood and curing several diseases caused by impure blood. This tonic is tested by several doctors and found to be very effective in various skin diseases. Manphar Sarasa is useful in retarding pimples and making your face glow with healthy complexion. As this tonic is mainly composed with Hemidesmus indicus, it is well useful in reducing excessive heat in the body and thereby cures boils and other skin erruptions occur during summer. It is well recommended in sunstroke. 10-15ml both morning and evening on empty stomach.